Compared with the earlier glories of Renaissance and Baroque art, and later the high points of the 19th century and Modernism, 18th-century European art generally ranks low among art connoisseurs. The one category that is much loved by the public—those highly detailed, recognizable cityscapes and architectural vistas by Canaletto , Giovanni Paolo Panini and other, mostly Italian, artists—was disdained by the academy. They were dismissed as the postcards of their day, souvenirs for travelers on the Grand Tour. "The Procession on the Feast Day of Saint Roch"
In "Eyewitness Views: Making History in Eighteenth-Century Europe," the J. Paul Getty Museum presents more than 40 of these "view paintings" and argues otherwise. Chosen because they depict not just topography but also ceremonies, festivals, natural disasters and other historical events, they are, curatorially speaking, the best of these "vedute" works. Commissioned by kings, queens, popes and ambassadors, these paintings were bids by the artists to vault themselves into the ranks of history painters, who occupied the highest rung of the art-historical hierarchy. In a sense, the artists were playing reporter, knowing that their works would influence the way the public construed contemporary events and later the memory of them. The nine painters in this exhibition, from three generations, took their usual great care to portray precisely the settings, and they depicted recognizable people, too, though they were by no means skilled portraitists. In "The Abdication of Charles III as King of Naples in Favor of His Son Ferdinand" (c. 1759), Antonio Joli renders the occasion when Charles, having just inherited the Spanish throne, turns over his lesser realm, symbolized here by a ceremonial sword, to his 8-year-old. Those two; a sad Queen Maria Amalia, who must leave her child as she moves with her husband to Spain; and the prime minister are all identifiable. The painters were also bound to convey the perspective of their patrons. Another work by Joli, which hangs adjacent to his "Abdication," features a moment that occurred later on the same day and was commissioned by Elisabeth Farnese, Charles's mother and the second wife of King Philip V of Spain. "The Departure of Charles III from Naples to Become King of Spain" (1759) is a sunny scene imparting two messages: Her son was beloved by the vast, emotional crowd bidding him farewell and his new kingdom came with a powerful navy, as represented by the 16-ship convoy carrying him to Madrid. 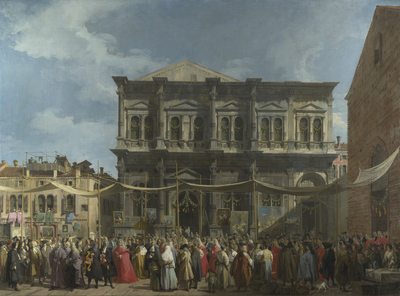 "The Giovedì Grasso Festival in the Piazzetta"
And Luca Carlevarijs, in "The Reception of the French Ambassador, Henri-Charles Arnauld, Abbé de Pomponne, at the Doge's Palace" (c. 1706-08), presents a scene in which the ambassador, intent on dazzling the government and people of the Republic of Venice, arrives in a gilded gondola. Pomponne, who commissioned the painting, hoped to persuade Venice to take France's side in the War of the Spanish Succession, the catalog explains. Even so, while portraying great events, these artists did not ignore sociology. The poor beg for alms in the foreground of Panini's "The Consecration of Giuseppe Pozzobonelli as Archbishop in San Carlo al Corso" (1743-44), a striking work populated by priests and nobles, including one lady whose fine, striped dress stands out even in the ornate Roman church. Bedraggled children steal fruit, front and center, in Panini's "The Lottery Draw in Piazza de Montecitorio" (1743-44). Families flee their homes in Hubert Robert's "The Fire at the Opera House of the Palais-Royal" (c. 1781). And the 1576 Venice plague, which killed a third of the city, is commemorated in Canaletto's beautiful "The Procession on the Feast Day of Saint Roch" (c. 1735). 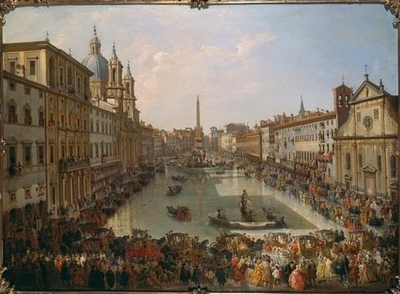 Canaletto is also responsible for what is, for me, the gem of this exhibition, "The Giovedì Grasso Festival in the Piazzetta" (1763–66). 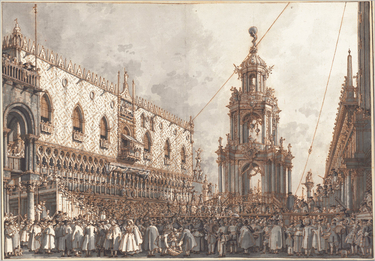 This meticulous drawing, smaller than most other works here, shows a Venetian crowd, half sunlit, half shaded, awaiting the "Flight of the Angel," a stunt involving an acrobat who descends on a thin rope from the top of Venice's Campanile to the loggia of the Doge's Palace. It's a shimmering marvel made only with brown ink, gray wash and white gouache. "The Flooding of the Piazza Navona"
Aside from festivals and ceremonies, this exhibition—the first to showcase only those view paintings that document history—takes museum-goers to weddings, regattas, balls, night processions, disasters, even the regular August flooding of Rome's Piazza Navona, which was intended to provide relief from the sweltering heat, as captured by Panini. Significantly, its scholarly catalog, by Getty curator Peter Björn Kerber, restores much of the meaning that was lost as these works passed from generation to generation. Therein lies its one flaw: While anyone can appreciate these paintings aesthetically, viewers—because of length limitations on wall labels—require the catalog to understand their layered meanings and slant. That should keep no one away, though: In "Eyewitness Views," the Getty has given the public a spectacular panorama of panoramas.